Custom Office Signs Instill Confidence | Mark Your Space | Chicago Area Sign Co.
Mark Your Space makes your brand look great. When a person walks into your office or storefront, give the best first impression possible. With well produced office signs, Chicago businesses can transmit quality right-off-the-bat. Your logo might not make or break your company, but a clean, fresh professional look instills confidence. And good business is largely built on trust. Want to transmit reliability with quality office signage? Then contact us or give us a call at (630) 289-7082 now. 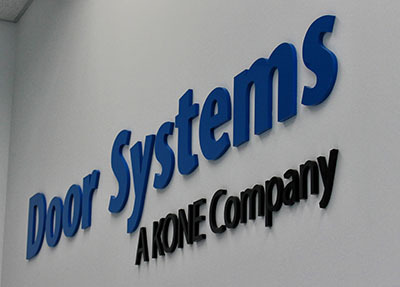 Mark Your Space recently completed an interior office sign and decoration project for Door Systems, a KONE Company. Door Systems is a Naperville, IL door replacement and repair service in the Chicago area. For the door services industry, security and safety are taken very seriously. But homes and businesses want good looks too. This is the message their office sign and graphics had to transmit. Your main office signage should be straightforward. Use bold colors as well a plenty of open space. Raised 3D lettering makes your name stand out even more. You can get great results with an offset mounted sign too. Strategic lighting adds attention to help your message stick. As soon as someone sees your logo, it’s doing its job. It presents your company’s name and personality. Are you serious or playful? Are you pushing limits or do you offer stability? Your brand’s personality should come through in the logo. Your storefront or office is space you own. Without a doubt, you should take full advantage of this space to promote yourself. Office signs are a great method for doing this. And since it happens on your own turf, it should be done as professionally as possible. After a visit to your business, you want to make sure your brand has been imprinted on the mind of your clients and customers - that’s Advertising 101. A great office sign can do this for you. You and your staff spend a lot of time in the office so it pays to make it more inviting. Sprucing it up a bit with office wall graphics can make your work area friendlier. Frosted vinyl provides privacy and style. Whatever you choose depends on your company’s profile as well as the office lay out. 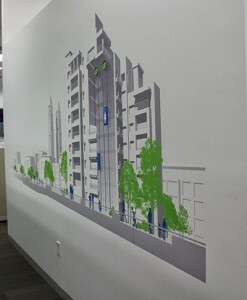 Take advantage of any wall or window space to tastefully promote your brand. Styles change and it’s important to keep up with the times. If it’s been a while since you updated your business brand, a new office sign campaign might be the best place to start. Your message spreads out from your headquarters, so any rebranding should start there. Make sure you consult with expert designers. The logo drawing is just part of the equation as certain styles might look better with different materials or presentation. A keen and experienced eye will make sure the finished product stands out among the competition. Want an office sign your clients will remember? Then contact us or give us a call at (630) 289-7082 now.